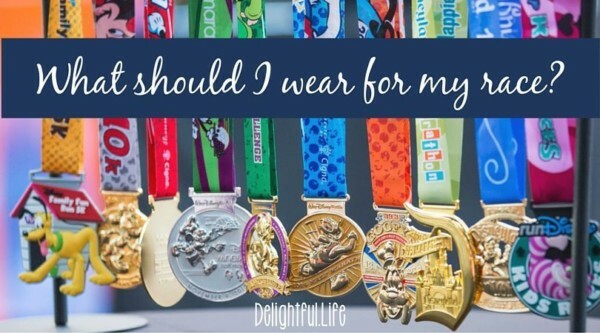 You are here: Home / Disney Destinations / What should I wear for my runDisney race? 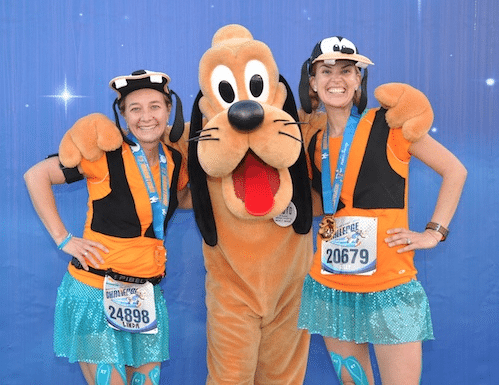 If you’re taking on your first runDisney event, you may be wondering: should I dress in costume? Disneybound? Buy new shoes for the event? We’re covering the basics of what you should – and probably shouldn’t – wear! First, whatever you decide to wear, wear it on a long run before the event. I distinctly remember holding my running skirt up during the entirety of a 5K, grateful it was only a 5K. You’ll be tempted to wear something cute you found at the Expo, but picture yourself awkwardly trying to keep your pants from falling down for 13-26 miles… and save the new purchases for when you get back home. There are actually a ton of variables to consider when choosing an outfit for your long races. Runners World has a super helpful tool to help you determine what layers to wear to keep warm and safe. 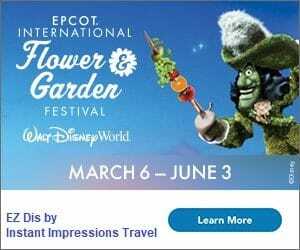 Ordinarily, runDisney events are mild enough that you won’t need running tights or long sleeves, but be sure to check the weather as your event gets closer. Also, keep in mind that the early morning starts can be quite chilly, so consider packing a sweatshirt or long-sleeved tee that you can part with. If you throw it to the side along the race course when you’re warm enough (a safe distance out of the road, please! ), Disney will collect it and donate it to charity. If you don’t have something just hit your local thrift store, or Walmart generally has plain sweatshirts for just a few dollars. Costumes cannot interfere with the safety of you or other runners. If a costume is questionable or offensive to others, we reserve the right to either have you change into something more appropriate or remove you from the event. They extrapolate on the policy a bit here, but it isn’t that different than in the past, aside from specifically speaking out against outer layers “that could conceal prohibited items” and the use of accessories that could be mistaken for real weapons. Costumes add an additional layer of fun to a runDisney event, but they aren’t absolutely necessary. Whether you decide to dress up or not dress up, you won’t feel out of place. One quick search shows the variety of costumes you may see. The ones that stand out most from my last race were a tuba player in full marching band regalia, Santa, and a haunted mansion caretaker. There will be thousands of people running in the official event shirt or a nondescript outfit, though. Wear what makes you comfortable. This is the first question I hear from probably more than half of the people who take an interest in running. The answer is, “I have no idea.” And it’s not because I have no idea what I’m talking about (which is often true, too), but because the right shoe for me is almost certainly not the right one for you. There are many factors that go into the right running shoes: stability, cushioning, whether they correct for the way your foot hits the ground, and more. If you’re at all serious about running, your first step will be to find a store that specializes in running shoes. They’ll be able to measure your feet accurately, watch you run and see how your feet move as you do, and recommend the right fit. You’ll usually get to try a few on for a quick run as well, and see how they feel. In my experience, these stores also have an extremely generous return policy in case a longer run doesn’t work out exactly as you had hoped. 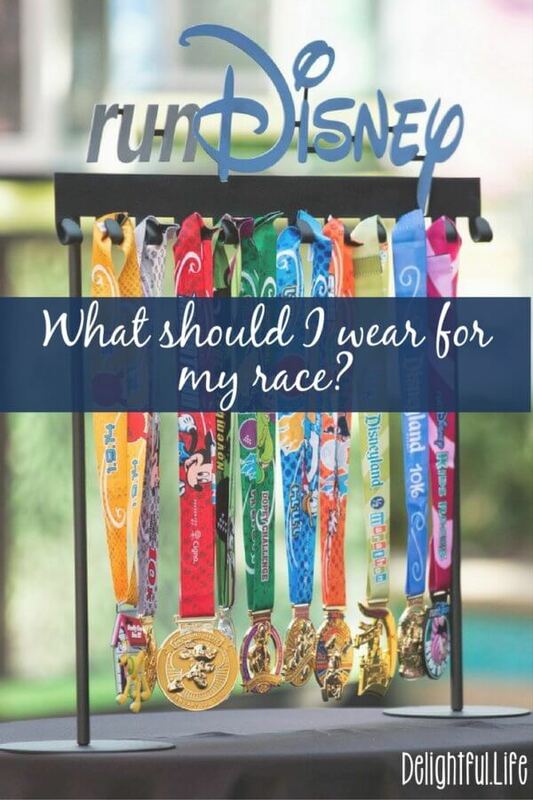 So… what will you be wearing for your first runDisney event? 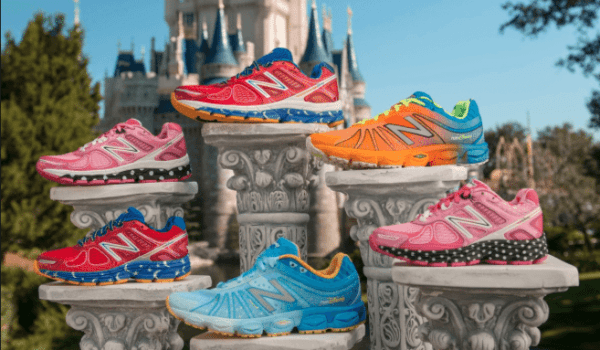 For more runDisney info, check out the other great posts from the Blogorail! Previous Post: « Star Wars: The Force Awakens is officially the highest grossing domestic film of all time! Great overview. It’s hard to convince yourself that it’s okay to run around your neighborhood in a costume, but if you really want to wear it for a race, you need to take it for a test run! Do you have suggestions or preferences on accessories for carrying your personal belongings or water bottle, fuel, etc.? Ha! I can see it now, running 20 miles in a costume in a nearby city. 🙂 I absolutely love my Flip Belt, and they’ve only gotten better since I got it several years ago. It’s not specifically for women, but my husband definitely wouldn’t wear one. He usually uses and arm band and a camelback backpack for hydration. I like the idea of a Disneybounding running outfit rather than an actual costume. I have my eyes on a Minnie Mouse running skirt on Etsy… There are so many fun ones to look at on there. YES! I got the red/white polka dot skirt from Sparkle and use it for a Minnie outfit. Disneybounding is the way to go, in my opinion, and there are so many cute options now! I honestly looked at some of the photos from the past races, and I’m not quite sure how some people managed to complete a race in some of the costumes that that were worn! I think Disneybounding is a much better idea and you’ll be much more comfortable.